Do you know Disney's cartoon, Phineas and Ferb? I don't, but that didn't stop me enjoying making a comic with Disney's Phineas and Ferb Comic Creator! Apparently it's a cartoon on the Disney Channel. The three main characters seem to be Phineas, Ferb and Perry. The Comic Creator is a lovely bright and clear interface, with a short guide to the process of creating a digital story there. Kids need to choose a template of panels, backgrounds, characters and speech bubbles by dragging and dropping from the menu to the working screen. There's also a facility to draw your own characters, save them and add them to your comic - you need to sign up for an account to do this. BUT kids can draw onto their comic the way I did with my springy creature, and download the result as a jpg to a computer, without signing up for an account. Being able to create and add characters from their own imaginations is a really nice touch, and makes the comic creation process much more personal for children. I chose a single panel, for quickness. I added a character, and dialogue was easy to insert in the speech bubble, with bubbles and font both sizeable. Drawing my own character made use of a fill bucket, and some interesting paintbrushes. The toolbar also has word art. As well as downloading, and saving as I mentioned above, there's also a print function. The downloaded jpg has a small ad for the Disney show at the bottom. 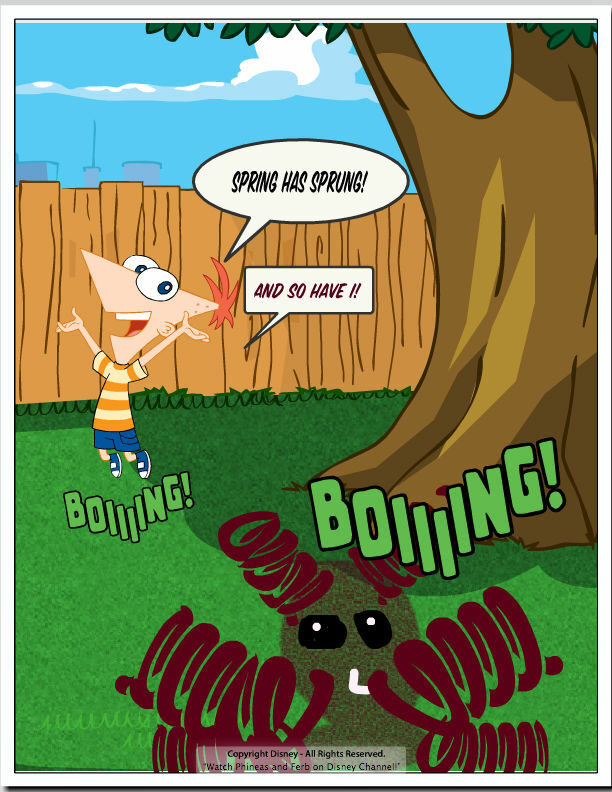 If your kids are calling for some screen time, why not help them use a comic creator like Disney's Phineas and Ferb? They will only realise they're having fun with words and images, but you'll know they're using a host of thinking and creative skills at the same time. If you're interested in other online places where kids can tell digital stories, you might like to read my articles: Fast and Fun Writing for Kids , Sharing Stories Using Online Editors and Writing Fun for Kids - Create a Caption.